Is On-Site Nitrogen Right for You? 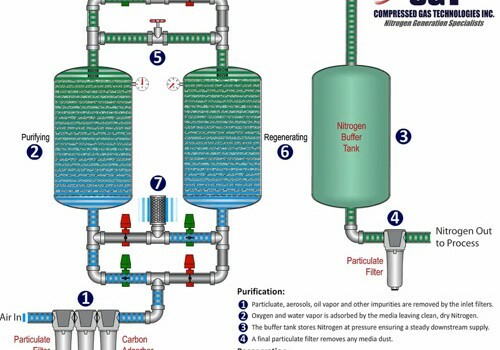 CGTIf you are currently using nitrogen for tank padding, drying, product transfer, purging, flushing, inerting, you should then look into the benefits of on-site nitrogen for your plant's compressed air supply. This is an easy and reliable way that can save you money and give you more control over your gas use. Companies who produce their own supply of on-site nitrogen can generate as much or as little nitrogen as they need, at a fraction of the cost of having the gas delivered by an external source. Generally speaking, there are two ways to make on-site nitrogen. There is membrane technology and PSA (Pressure Swing Adsorption) technology. Flow rates and purity will determine which technology is best suited for the application. The first type of on-site nitrogen is Membrane Technology. Membrane nitrogen generators are typically used in applications where the purity requirement is below 99.5% (0.5% O2 or higher). Membrane Technology works by filtering oxygen from the dry compressed air stream via hundreds of thousands of hollow, polymeric fibers each the diameter of a human hair to produce gaseous nitrogen. The purity of the nitrogen (O2 Content) can be adjusted by regulating the volume of air passed through the membrane. Membrane modules can be added as necessary, so it's easy to expand as requirements change. Applications that are useful to on-site nitrogen of the membrane filtration variety are: snack food packaging, laser cutting with nitrogen, tank padding, tire filling, rapid prototyping, RIM (Reaction Injection Molding), Injection Molding (Gas Assist), fruit storage, power stations, dry box storage of assembled electronic components, mine fires, fire sprinkler systems, and beer dispensing. One such on-site nitrogen membrane generator is the PMNG "E" Series nitrogen generators. PMNG membrane nitrogen generators use patented membrane technology to produce an uninterrupted supply of gaseous on-site nitrogen. This compact system is ideally suited for low-flow applications that presently employ high-pressure gas cylinders or dewars of nitrogen. The second type of on-site nitrogen is PSA (Pressure Swing Adsorption) Technology. PSA nitrogen generators are generally used in applications where the purity requirement is higher than 99.5% (0.5% O2 or below). PSA technology utilizes two towers that are filled with carbon molecular sieve (CMS). Compressed air enters the bottom of the "online" tower and flows up through the CMS. Oxygen and other trace gases are preferentially adsorbed by the CMS, allowing nitrogen to pass through. After a pre-set time the on-line tower automatically switches to the regenerative mode, venting contaminants from the CMS. Carbon molecular sieve differs from ordinary activated carbons as it has a much narrower range of pore openings. This allows small molecules such as oxygen to penetrate the pores and separate from nitrogen molecules which are too large to enter the CMS. The larger molecules by-pass the CMS and emerge as nitrogen gas. Applications that are best suited to on-site nitrogen of the Pressure Swing Adsorption variety are: snack food packaging, bottling (wineries), laser cutting with nitrogen, tank padding, tire filling, power stations, Injection Molding (Gas Assist), fruit storage, lead free soldering, beer dispensing and mine fires. Suggested PSA on-site nitrogen generators would be MIDIGAS and MAXIGAS integrated systems as the inconvenience of gas cylinders and liquid dewars is eliminated. Nitrogen can be generated freely at your location, in a continuous and reliable way that only requires a supply of compressed air. Compressed Gas Technologies can answer all your questions about on-site nitrogen production - contact us!